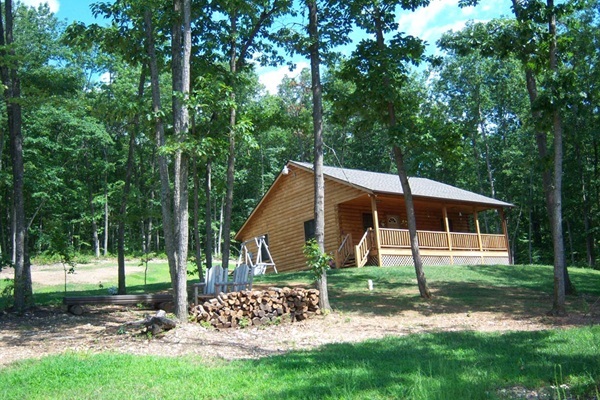 The Little Al Cabin is a Daniel Boone Log Home Design. It is a beautiful two bedroom with rustic log queen beds and 1 bath cabin in Stanley, Va, in the heart of the Sheandaoh Valley and Blue Ridge Mountains. This cabin is perfect for a romantic getaway,honeymoon or family vacation. The Little Al cabin is great for just relaxing on the covered front porch rocking in the rocking chairs or star gazing from the hot tub. Enjoy a DVD movie or Satellite TV by the peaceful ambiance of the electric fireplace.The cabin is completely furnished and linens are provided at no extra charge. Enjoy a campfire with the wood provided at no extra charge.Try your luck fishing at the two-acre pond and having a picnic at the picnic shelter and swinging in the log swings. Children will love the play set.